By vaibhav_arora. Created on Oct 12th, 2013. Last updated on Mar 8th, 2019. NOTE: This part two in a series of articles about Vaibhav Arora's off-the-beaten-path trip through Amarkantak. 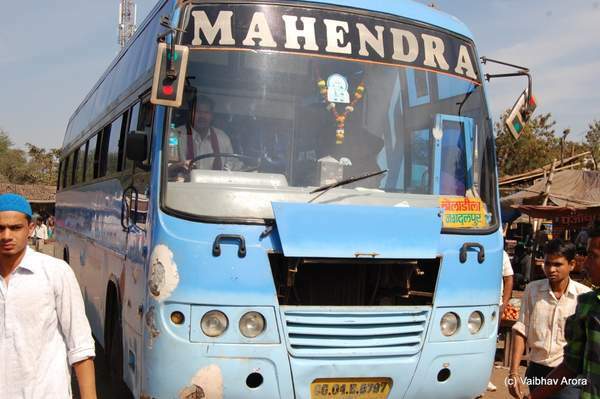 The Mahendra travels bus was scheduled to depart at 10:10 am from Pandhri, Raipur and claimed to cover the 200 odd kilometres distance to Kondgaon via dhamtari and kanker in about 4 hours. An electric vehicle that theoretically sat 7 people excluding the driver was loaded with 11 people and their luggage at the scheduled departure time of the bus and we were all transferred to the Pandhri bus stand from where the buses depart. The ten minute transfer was the low point of the trip (Raipur is the most polluted large city in India and my eyes were hurting from the growing smoke). Once near the bus I had to shout at the conductor that my bag was too large to be kept below my seat. The bus was also supposed to be air conditioned (This being the month of December the aircon it was switched off - but the windows wont open for most part). The inside of the bus resembled a russian nuclear sub's sleeping quarters. On the right was a two by two seating arrangement topped with a two by two sleeping berth. On the left was the same except the berths were single sleeprs - the seats remained two by two. Being used to the Rajasthan roadways aircon buses - this was a very rude shock. Come the highway, it became clear that the 'air-suspension' was only good enough to throw each passenger two inches into the air above their seats as we encountered pothole after pothole. Whatever happened to the smooth roads? The inside of the bus grew uncomfortably warm and I finally managed to push open my glass window to let some cool air in. 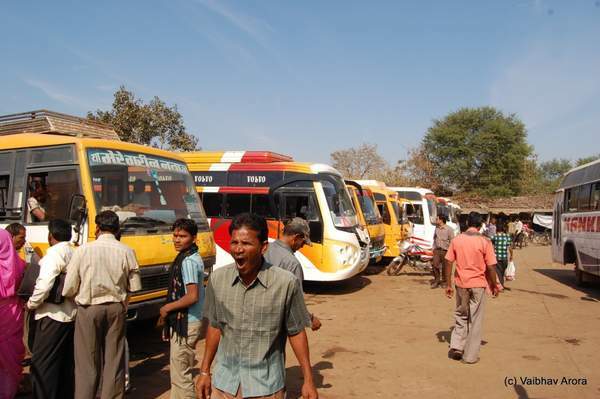 We stopped at non-descript bus stands in towns like Dhamtari (seen below is the bus stand) where the locals sold 'punjabi lassi' in the hot sun. ('psst, are you homesick for delhi belly? dont worry, we have it here over 1500 kms away - just drink this!!'). 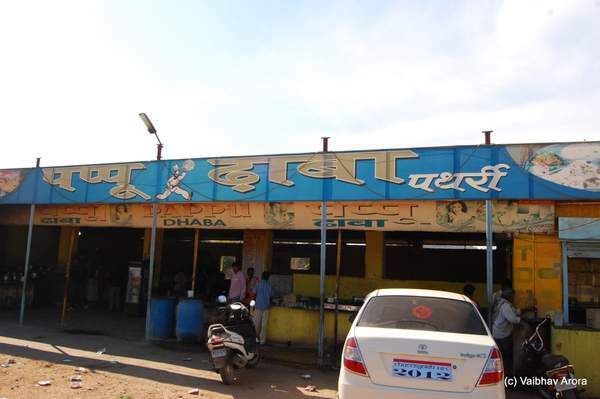 At one thiry pm we stopped at Pathari - a lone dhaba for over fifty kilometers, and clearly surviving due to his 'business tie-up' with all three bus companies of the state. Mr pappu (the man at the dhaba counter) was a socialist - he charged people based on their ability to pay. Since I was the only DSLR toting yuppie in the bus, I had to pay Rs 70 for the same dish of mix vegetables that cost my co-passenger Rs 40. I found this later, about 10 kilometers later. After the non-descript town of Kanker, we were soon into Keshkal valley - a place I would definitely return to explore some day. Keshkal is unique as the forest is very old, dense and stunningly green. 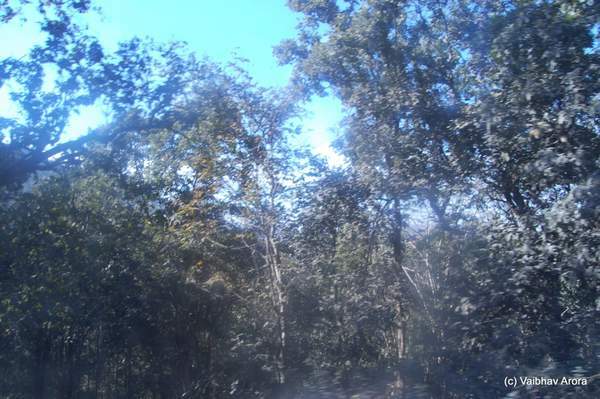 It also has some palm trees mixed with deciduous (the forest if i understand correctly, lies on the northern limit of the moist tropical and the southern limit of deciduous tree lines). Due to the moving bus, I can at best present a faint impression of what I saw. The bumps of the road notwithstanding, my mind was racing ahead to plan for the rest of the day. I called up Mr Bhupesh Tiwari who runs 'Saathi' - an NGO in Kondagaon (we had been in conversation for past few weeks about my possible visit) and he advised me to get town at Naryanpur T-junction instead of continuing all the way to Kondagaon. At nearly 4:00, I was at Narayanpur junction where his man friday, Mr Ramnath arrived with a bike. Thanks to the luggage I had with me, I just gave him my bag to carry to the Saathi campus while I walked that 1 km distance. The sun was getting lower already and it was a beautiful, peaceful countryside setting. 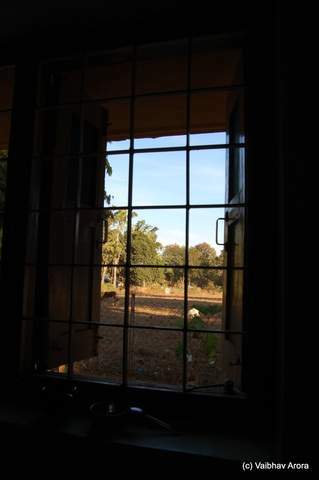 Mr Tiwari has been running Saathi for a while now (over ten years) and has a small functional guest house for visitors who're interested in either terracotta (for which Kondagaon is famous) or Dokra (the traditional bell metal craft of bastar). My interest was in the latter and I had reserved most of the next day to just look around and more importantly understand the process from some of the masters that live in Kondagaon - quite a few are independent and some work on campus of Saathi. The room had a view of the nearby fields. After a cup of sweet, milky tea and a quick wash, I was escorted by one of the employees to visit their workshop area. A few metal workers were trying to beat a deadline for a custom order that would be delivered (of all places) to a gym in Jaipur!! Upon learning that I am from Jaipur, they grinned and got quite chatty. I learnt a bit about the 'dokra creation' process that day. It was nearly sundown when I left the workshop after looking at some spectacular pieces that the metal-workers had created. Seen below is a large, heavy lamp that showed 'telagin mata' - a tribal goddess along with Raodeo (in the centre) - the spirit god that rides a mythical horse and protects the fields of the many tribes that dot bastar. 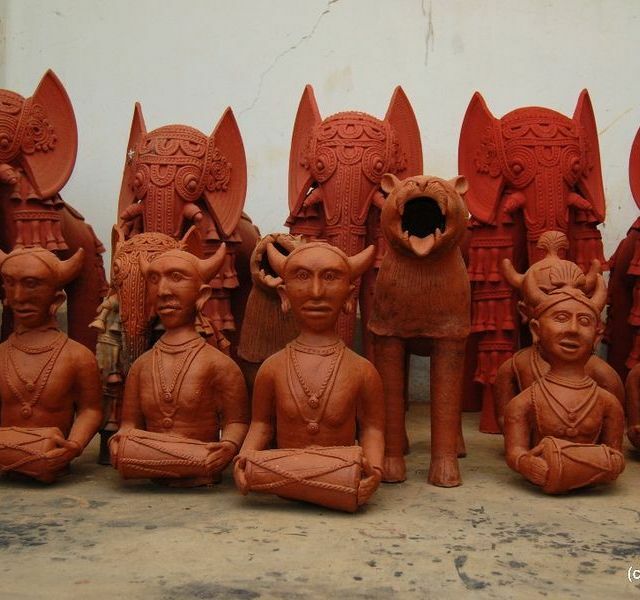 The workshop has a great pottery collection as well, statues of lions, elephants, tribal men and women (seen below). A master potter's home was the next stop on the itinerary. I wanted to understand how they created these large, unique and very heavy terra-cotta elephant statues. The elephant statues of bastar usually depict decorated elephants. A short walk later, I was in the village nearby and sitting on the mud and dung floor of the master potter's house. He was very happy to have a visitor and explained everything in detail. In a nutshell (and please look again at the elephants in the photo above), each rounded element of the elephant (his trunk, his legs, each bell that adorns the body) is created on the potter's wheel. The potter gets one chance to get that piece right - if it's not right, the piece is discarded. The ears of the elephant are actually one large circular piece that is simply cut when not in a totally dry state using a knife (they look like sectors). Finally, the entire elephant is pieced together by hand, left to dry for two days or more and baked in a kiln. It's an old (several hundred years at least) process that's handed down through generations....He was a bit sad that his son, at present, is not as proficient at the craft as he is, but was optimistic. 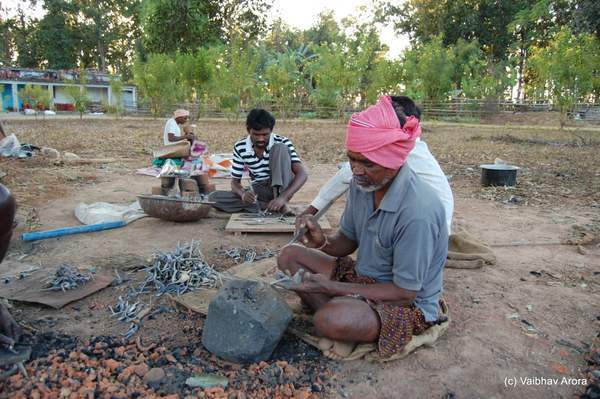 I was very tired when this day ended - but very happy and looking forward to knowing more about Bastar and its crafts. Despite the impression given to me the previous evening, there were no birds at all near the river or inside it!! I was very disappointed. I did learn later that day what causes the stark absence of any bird of animal life near waterbodies. This is in marked contrast to Rajasthan - my home state- where even a bit of water invariably is accompanied by vegetation and birds and animals of different sizes. In that parched land, water gives life and the desert celebrates every drop like no other terrain does. I walked around a little bit more through the village roads, narrowly avoiding a rather unhappy cow hitting me (the owner came out stating - 'she can recognize between local and outsider, I will tell her to move away') Holy Cow!! 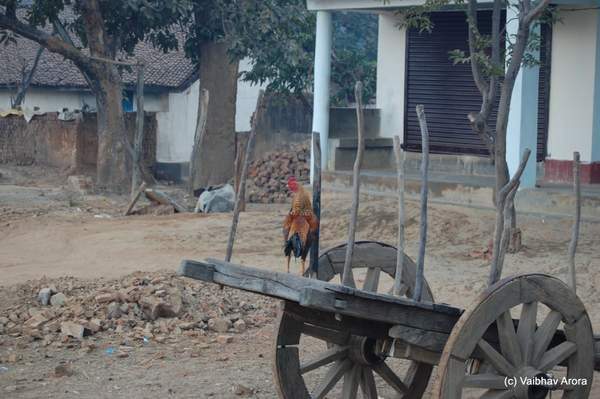 There was also an angry rooster - trying his level best to balance a cart in the absence of the bullock pair. He fluttered and failed and perhaps he was at his failure to tip the cart the way he wanted to? Anyways, I kept my distance. The village is largely inhabited by the Muria tribe (one of the major tribes of bastar). Some interesting information was to be found on many of the houses that the government had helped built. The writing on the wall reads 'I, so and so, am a below the poverty line citizen and I obtain x Kgs of rice for y rupees per month. It also shows the amount of grant given to the person for constructing that house and outstanding government loans'. As a city dweller, I'd find it strange and perhaps just plain offensive if I were forced to put up the name of my lender (say a bank or an FI) on the front of my home along with how much my mortgage is worth, but the villagers seem to have no problem with it. See a shot below. I asked later about the significance of the colors on each of those houses (some were green, others pink, some blue) and found that its pure economics. They simply paint the house in the cheapest color available! Back at Saathi, after taking a bath, over a leisurely breakfast discussing the economics of the weekly markets with Mr Tiwari and the daily lives of the tribes with his friend Mr Joshi, I learnt of the terrible secret behind the empty forests and fields of bastar. Due to the hunting gathering culture of the tribes, they simply shoot, capture or otherwise hunt and eat all the birds that not only live there but also the ones that migrate from over these lands. 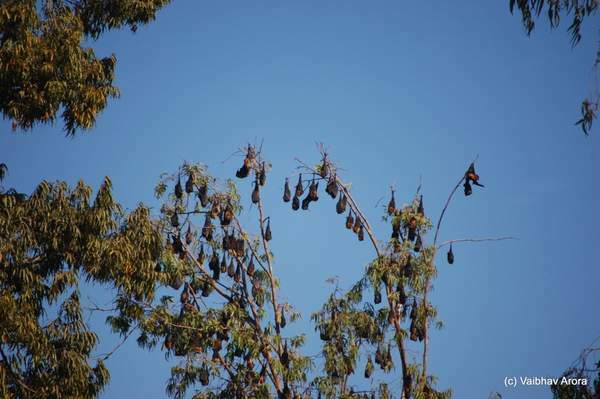 Hence, the forests, though they are thick and green house only rodents, reptiles and other species that do not yield sufficient meat. That explained the empty river bank. I started on a hired bike for the village of Bhelwapadar (5 kms from where I had spent the night) to learn more about the dokra (traditional bell metal) craft of bastar. 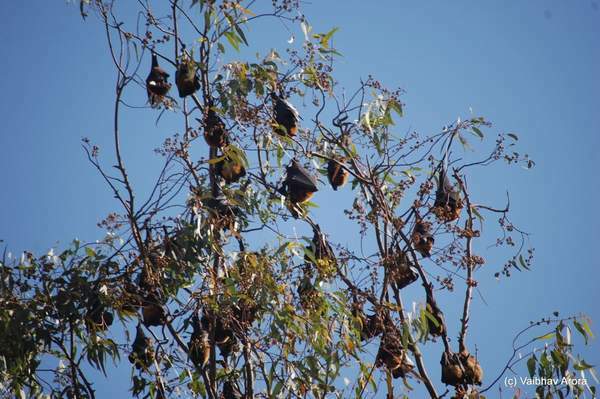 En route, stopped by the wayside to notice hundreds of fruit eating bats (flying foxes) hanging from eucalyptus trees. It was a wonderful sight. The photograph does not do justice to the size (about the size of a small dog or a very large angora rabbit) of these flying mammals. Thanks for your prompt reply VA. I have only just started making the plans. Hope I am not too late in booking the hotels . Will definitely keep your advice in mind regarding the guide. Am I right in presuming that we may need his services while in Jagdalpur and not while visiting Chitrakot or Tirathgarh? 2nd Oct: Visit Chitrakot waterfalls and then Kondagaon (Saathi Samaj Sewi Sanstha, Kumharpara). Back to Jagdalpur. Is this doable in one day? Also, will it remain open (as this day is a national holiday)? 3rd Oct: Visit KVNP (Kutumsar cave and the musical Kailash Gufa, Tirthgarh waterfalls). Back to Jagdalpur. How much time will it take if we hire a private vehicle ? 4th Oct: Leave by 5am. 30th Sept: Reach Raipur. Move to Kondagaon. Stay the night at Saathi. 1st Oct: Stay at Saathi till lunch. Move to Chitrakot. Stay overnight. 3rd Oct: Spend the day at Jagdalpur (or visit Tirathgarh if not done earlier). Hope to hear from you soon as I would have to make the hotel and train bookings accordingly. Vaibhav, it would be very kind of you if you could reply to my previous post (#121). As I shared my plan with my family, they have also become very enthusiastic about visiting Bastar during Dussehra and our group number have now swelled to 8 (including elderly parents) with possibility of a few more additions. So, as you may understand, I am really pressed for time. Please see revised plan , in case 1 has to be followed - else go to 2 directly. 1st Oct: Reach Jagdalpur at around 5 am. Check in at hotel and spend the day there (I strongly recommend that you check if there're dussehra festivities - one day should be recommended to them. Call Naman resort/ Saathi / Shakeel rizvi to get that date) . If not, then use the day to visit the museum and continue to Chitrakot waterfalls. 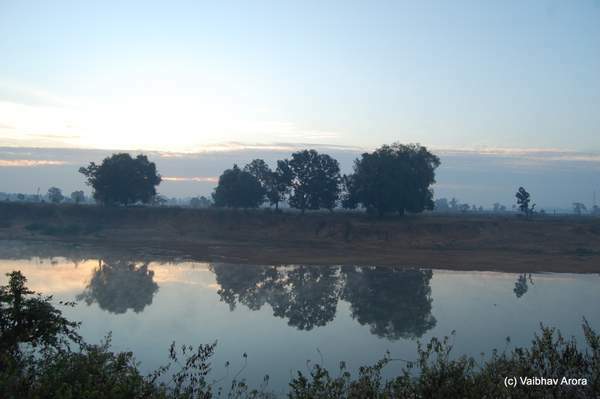 2nd Oct: Visit Kondagaon and return to Jagdalpur. 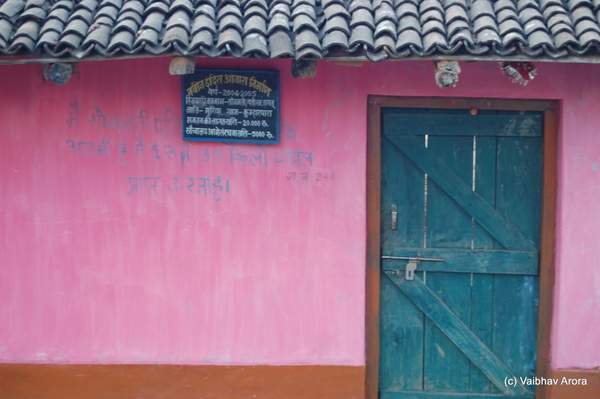 Call and check beforehand if you'd like to stay at Saathi (their rooms are quite basic). Otherwise, use the rest of the day for any tribal market visit. 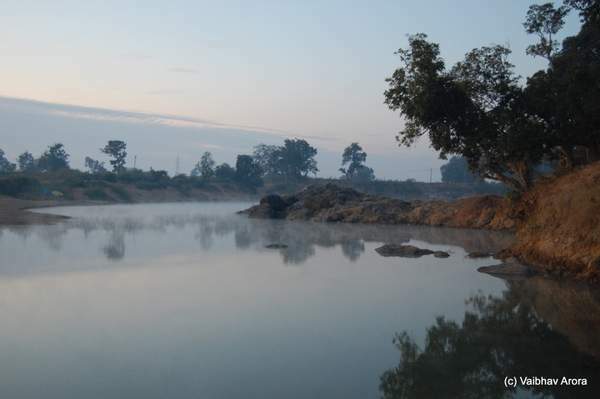 3rd Oct: Visit KVNP (Kutumsar cave and Tirthgarh waterfalls). Back to Jagdalpur. How much time will it take if we hire a private vehicle ? This depends on road conditions. It's a one hour plus drive to Kutumsar and another half hour to Tirathgarh. On this day, if you have time in the evening, check if there's any tribal market in Chotta Kavali / Kavali Kela area. Yes, this is a better plan. Thanks again Vaibhav. From some other sites I gathered that the Bastar Dussehra is to be celebrated from 30th Sept. to 4th Oct and the festivities are mainly held at night. But I will keep your suggestions in mind and talk to the people mentioned by you beforehand. Hope you are in better health now. Thanks for your suggestion to spend not more than 2 days in Amarkantak. 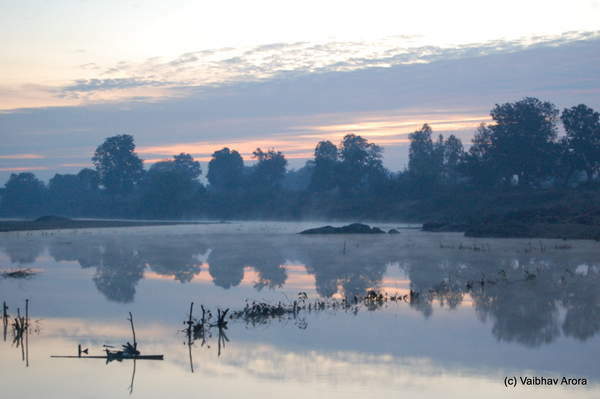 Could you suggest some place near Amarkantak or Bilaspur for 1-2 days. 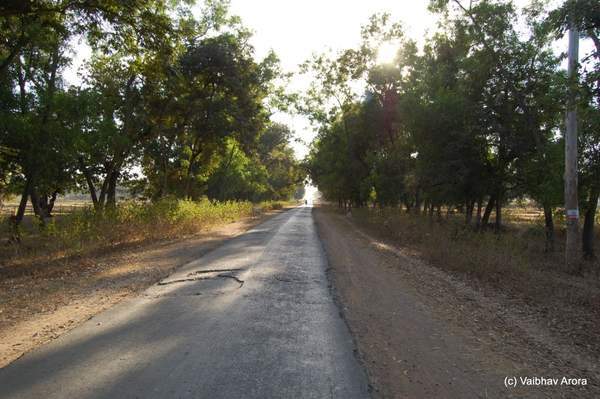 You could hire a car and go to Achanakamar sanctuary. Please use the search function to dig out a relevant thread - a fellow IMer had gone there. anything else? Achnakamar sanctury does not open till november. A superb post, with detailed information! Great reporting and pictures, thanks Vaibhav, thoroughly enjoyed and was absorbed! It was great fun reading this travelogue. Perhaps the best of your travelogues vaibhav. Very uncomplicated & easy to follow. Inspires me to go to this unpopular state.